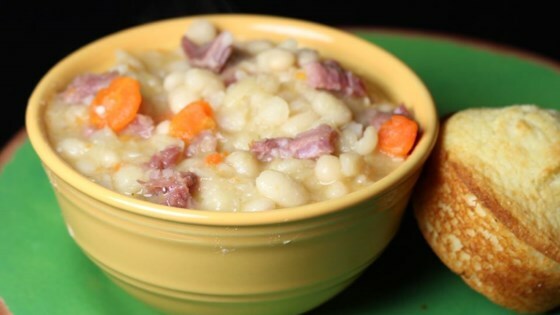 "Hearty ham and bean soup. Easy to make and a great way to use a leftover ham bone. This soup also has lots of mixed vegetables." Rinse the beans, sorting out any broken or discolored ones. In a large pot over high heat, bring the water to a boil. Add the salt and the beans and remove from heat. Let beans sit in the hot water for at least 60 minutes. After the 60 minutes of soaking, return the pot to high heat and place the ham bone, carrots, celery, onion, garlic, mustard and bay leaves in the pot. Stir well, bring to a boil, reduce heat to low and simmer for 60 more minutes. See how to make a hearty bean soup with leftover ham.